Designers Eiri Ota and Irene Gardpoit Chan of UUfie have completed the renovation of an apartment in Kanagawa, Japan, where the space is divided by two velvet curtains. Called Nagi, the 1970's apartment was stripped back and coated in diluted white paint. Two tracks snake through the space above head-height. 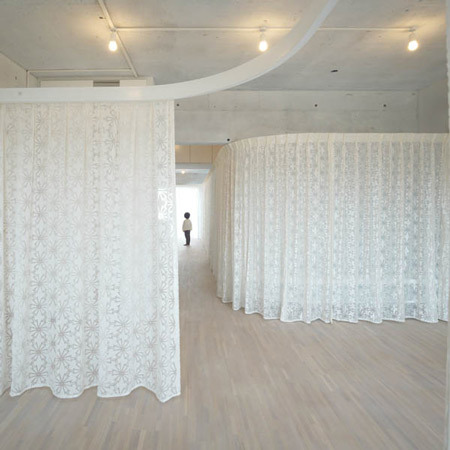 Curtains made of patterned white velvet can be moved along these rails to open and close off section of the home. Photographs are by Daici Ano except where stated otherwise. Nagi is a renovated living space for a young married couple and child in a 30 years old apartment complex. After dismantling the existing space, and fixing the furniture into the skeleton of it, it is then painted in 70% diluted white paint. Next, 2 curving steel pipes, 13m and 4.5m in length are suspended at 1.9m from the floor creating an illusional division. Hang with no support from the ceiling, they function like railing of monorails in the city, distributing to the respective spaces. Curtains are hung along the extend of the railing. The curtains are made with velvet fabric and are printed with geometric patterns through a processes of melting rayon on to fabric. Permeability is controlled, allowing visual privacy while having light transmission across the spaces. In the future, these can be exchanged for partial curtaining, hanging of art and photography, thus adjusting to life and changing circumstances. However, the railings will always remain there as a backbone to their life.